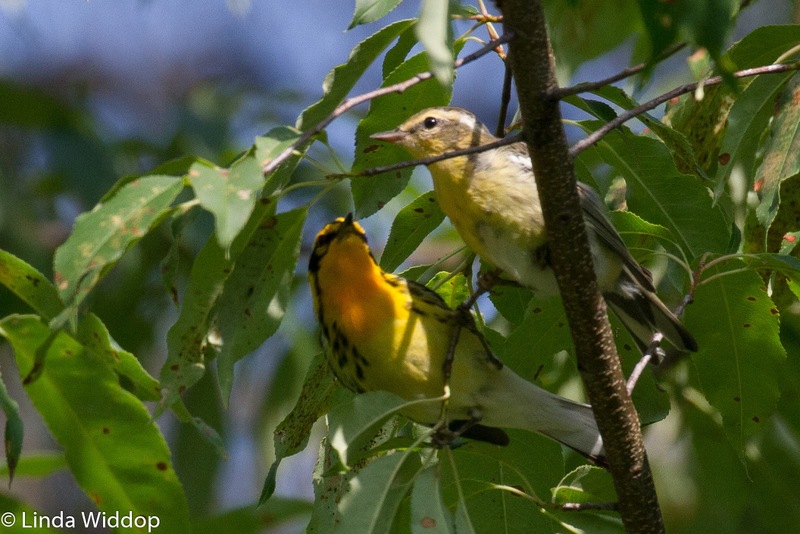 Philly Bird Nerd : Where Have I Been? Sorry for the gap in posts. It has been a tough month. Our beloved Roxy succumbed to stomach cancer suddenly. 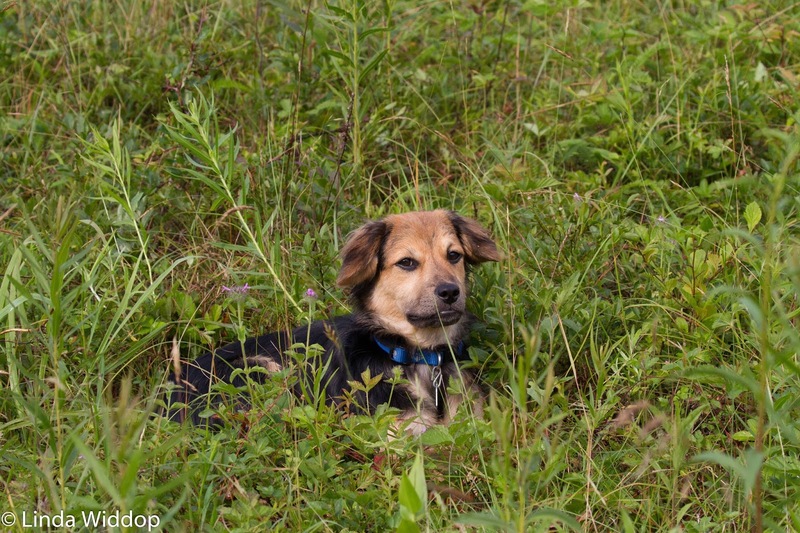 The symptoms began before I left for Europe but the diagnosis wasn't made until I returned. Needless to say, I took a break from birding to focus on her care and subsequent death. Sorry to be a bummer but that's what has been going on. The other thing that's been going on is a new puppy. Yup. We didn't want a puppy but we went to adopt a dog and ended up with a 7 month old puppy named Peanut. I forgot how much time puppy's consume every day. Every day. Even as I attempt to process these photos and write this story, she's terrorizing the cat, chewing anything she can get her teeth on, and generally exhausting me. But honestly. Look how adorable she is. Even when she is being a terror puppy, she's cute. 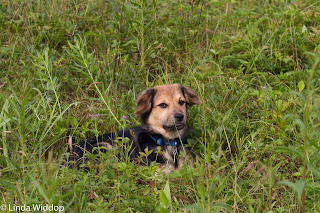 Connie and I did manage to get up to the cabin in Potter County last week. Finally got some pure birding time and even managed to snap some photos. 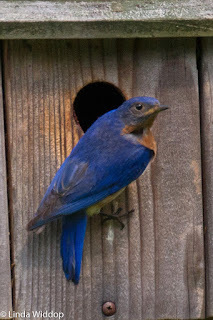 It is always nice to see that the Bluebird box that I put up in the field actually has Bluebirds in it. 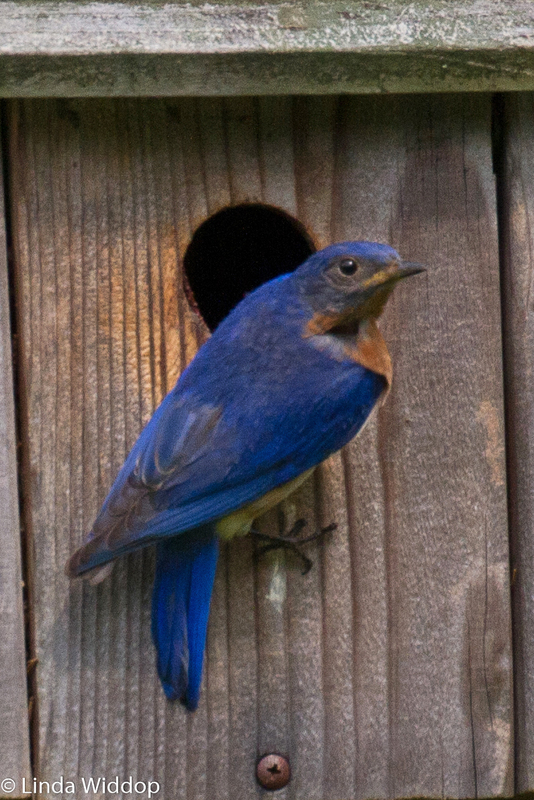 Most years, this box is claimed by a pair of Bluebirds but the other box is home to Tree Swallows. 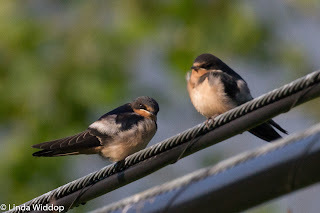 Speaking of swallows, there are nesting Cliff Swallows down by the stream. Here are a few babies hanging out on the phone wires waiting for Mom to deliver a bug. 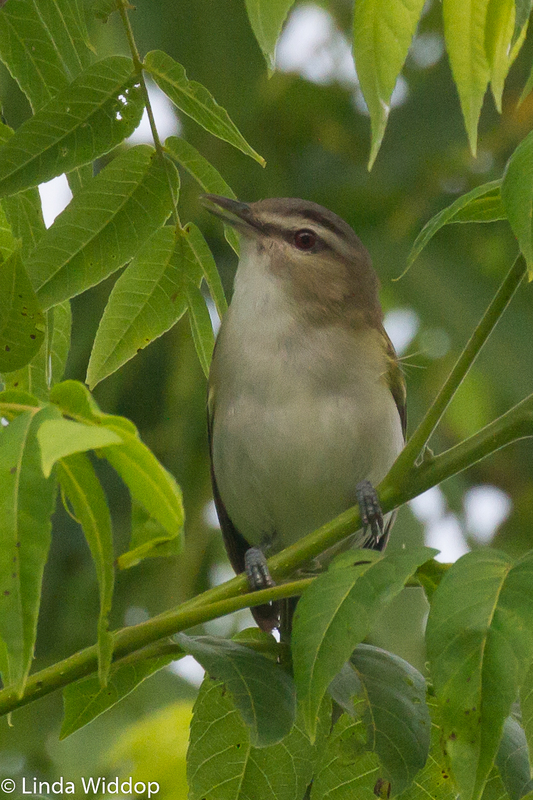 Other common nesting birds include Red-eyed Vireos. This one was doing the usual constant singing even while he/she was hunting for bugs along the stream. It's a shame that our weather was so iffy. Overcast most of the time and rain almost every day that we were there. 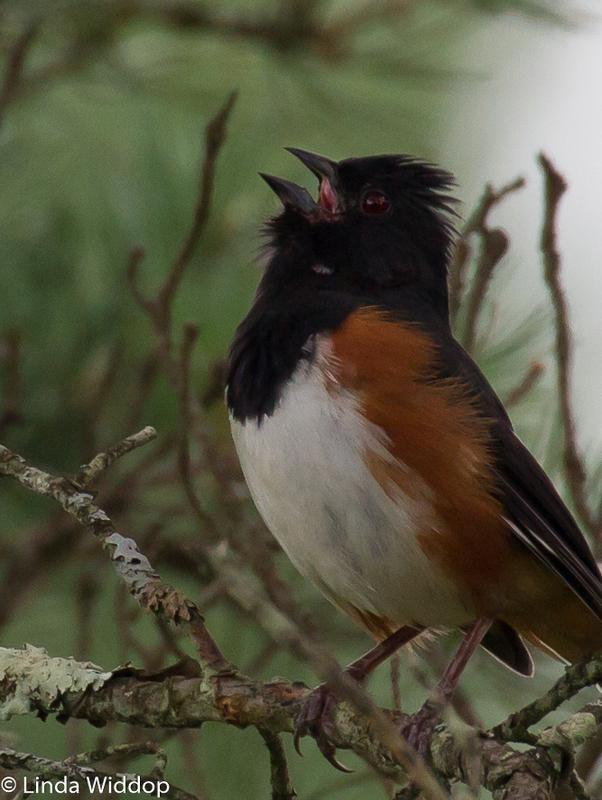 This Towhee didn't mind. He sang anyway. 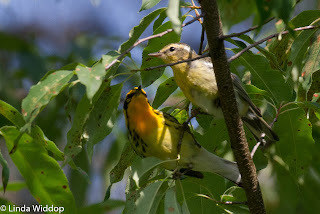 It was amazing how many birds were still singing even though it was obvious that they already had nests going and babies to feed. I would assume that the singing would end once the birds had mates and chores to do. Oh well - just goes to show you that hormones keep going even into the mid summer. One of my favorite birds at the camp is Blackburnian Warbler. This bird is a little black and white gem that has a flaming orange throat. The song is very high pitched and difficult for some people to hear - especially men of a certain age who lose their ability to hear the high notes. I can hear the warbler very well and find it pretty easy to find the resident birds around the camp. This year, I was luckier than ever. 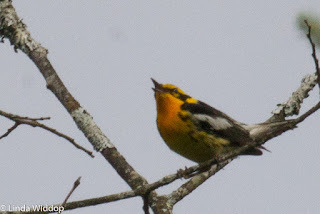 Not only did I find the singing warbler perched in trees all around the cabin. . . 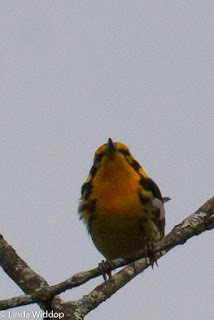 Even with the dreary sky behind him, you can see the bright orange throat that makes birders like me go ooh and aah. 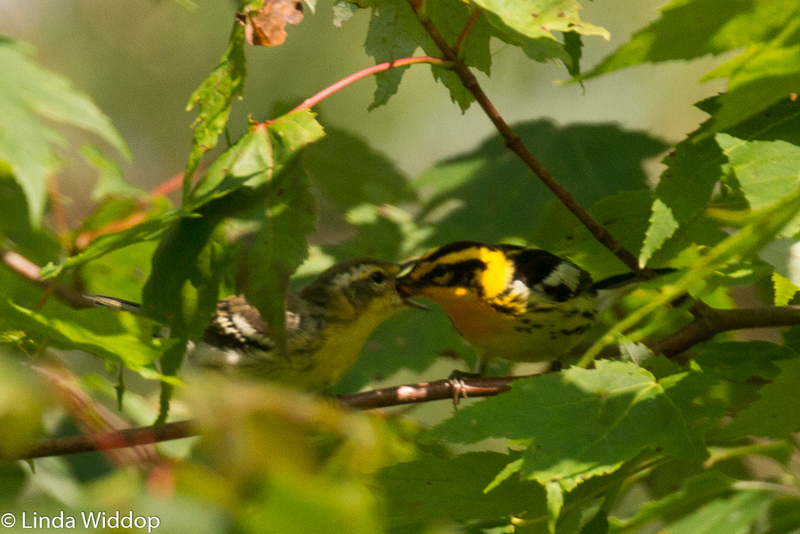 But I also got to watch this Dad feed one of the youngsters for about 15 minutes. 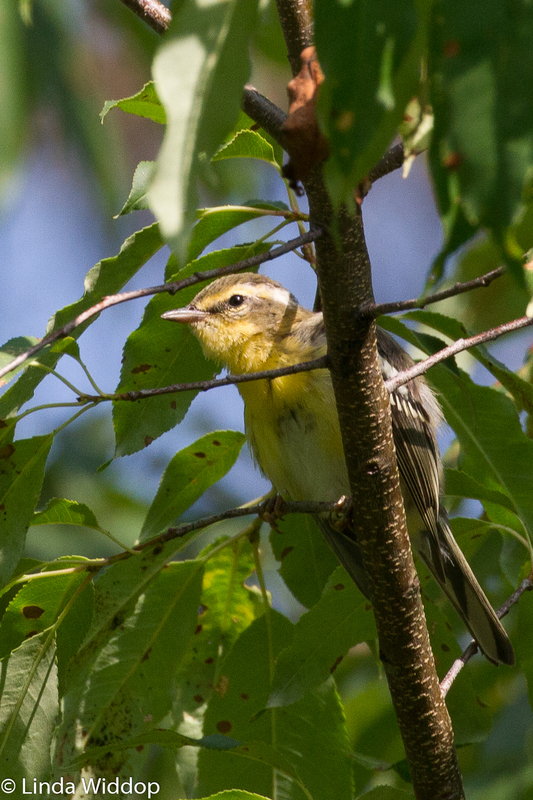 The youngster sat in a low tree right along the driveway preening and waited for Dad to bring caterpillars. You can see that the young warbler is nothing to look at. Pretty drab. Dad showed up with a worm. 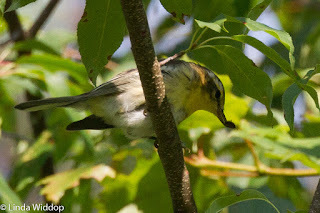 You can really see the bright orange throat. Junior even managed to find his own bug while waiting on Dad to return. Dad brought another worm. This time, I captured the moment when Dad jammed the bug into Junior's big mouth. I'll bet Dad can't wait for Junior to be self sufficient. It shouldn't be long now. One of your best for many reasons...and I think you know why. However, it's not nice to make the "HH" sad.